YPLA $36,000 RAFFLE​ HAS BEGUN! Click on flyer below to purchase tickets! YPLA Joshua Tree from YPLA on Vimeo. YPLA is a dynamic Morning Learning program for young men who have graduated Yeshiva/Jewish high school and are motivated to continue their Torah learning while developing their academic and/or work skills in the afternoons. ​Housed in the vibrant environment of Rabbi Brander’s LINK Kollel, YPLA ‘s program is directed by Rabbi Aryeh Steinman and Magid Shiur, Rabbi Yisroel Casen. Together they developed a rigorous part-time learning seder. 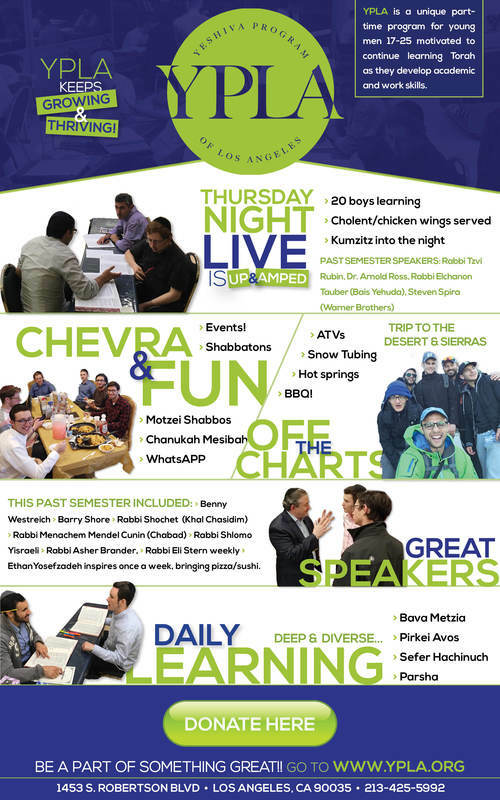 Rabbi Steinman organizes Shabbatons, trips, and events, thereby creating a true chevra and a solid Torah foundation in which these students can flourish and thrive. While Rabbi Casen delivers a dynamic and deep shiur everyday, he is also there as a guiding light for boys seeking advice. If you are a young man or know of other young men (17-25) living in Los Angeles who want to stay connected to Torah, YPLA provides THE place to share and grow in Torah values and connect to other young men in an innovative, challenging and fun environment. YPLA was, and is, exactly what I need to continue my Torah learning and growth to become the best Jew I can possibly be. Without YPLA, I would honestly not be learning Torah right now. YPLA gives me direction in all areas of my life, it fuels me with a passion to make clear decisions and stick with them. Coming to YPLA has had a tremendous impact on my growth... The daily breakfast, trips, create a huge ruach and energy that is truly refreshing. YOU can make a difference by donating to YPLA. Take this opportunity to invest in Torah learning in Los Angeles! Get the latest YPLA news in your inbox!